First of all, I hope you all had a shot at your favorite spot yesterday cause it was all time…I had the longest sweetest cleanest most tasty cover up of my life yesterday…it has been stuck on repeat in my head ever since. Along with some of the biggest waves I’ve seen at Rincon in a long while. Wow. Now, you better be calling in sick today with all the rest of southern California, cause today is going to be even better. 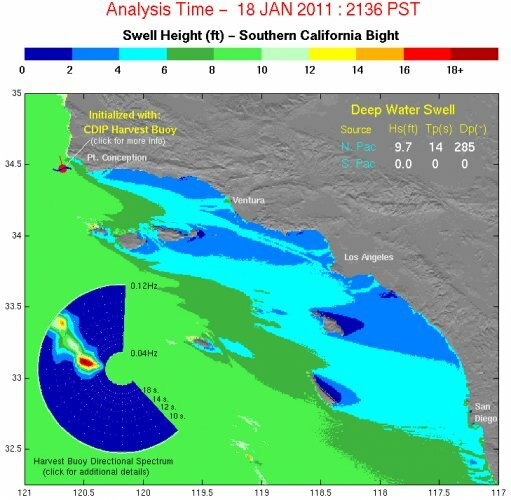 I went to check the surf report last night and this is what I found…looks about normal, a big swell, promises of fun times today…until I realized that this swell is clearly a shaka that is blowing up all our favorite spots and slamming into LA…This image is not manipulated or enhanced, the swell literally appears to be a shaka shaped hand slamming into LA…or maybe beauty is in the eye of the beholder. Go surf!